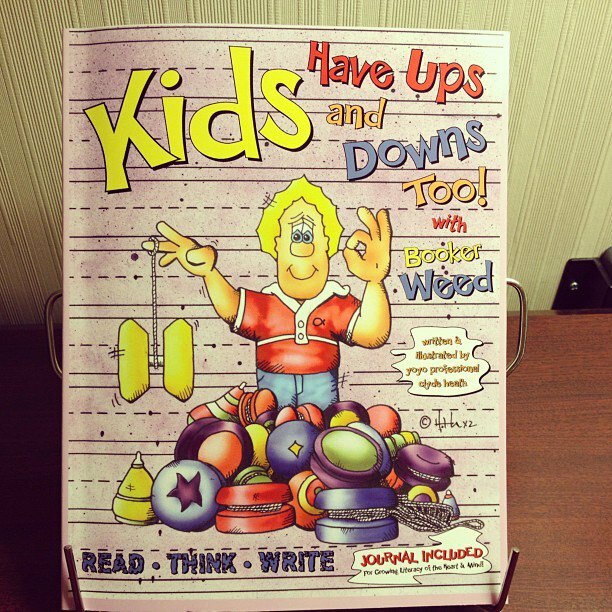 Booker Weed | Star of the kids book series, "Kids Have Ups & Downs Too!" Excited to announce the release of Kids Have Ups and DownsToo!. Growing Literacy of the Heart and Mind Cultivates the Landscape of a Child’s Future. By including a journal in the back of our books we believe “If you encourage a child to journal their thinking turns to writing.” No matter what is happening at home, in our neighborhood or with our friends we have what it takes to make good healthy positive choices is the theme throughout my series of books. Just in time for Christmas Booker Weed will be a fun read and journaling will inspire kids to share their thoughts and feelings while reading their own chapter book. I remember growing up thinking how cool it would be to have a buddy who took the time from their popularity to say hi or even invite me to participate in a game. Please consider impacting the life of a sheltered youth and help get this Airstream on the road with a small donation … thanks so much! What is your rousing or uplifting identity that tells others who you are? Maybe you want others to know your call in life or maybe your cause? I want others to see how I try to live like Christ spoke the Truth because He was the Truth speaking. I want Christ to be my anthem. I may hit a wrong note at times but the conviction of my heart sets me back on track. I write & illustrate kids books because the anthem of #BookerWeed is sharing with kids that no matter what’s happening at home, their neighborhood, or with their friends they have what it takes to make #goodchoices. #BookerWeed – Go figure … This odd yet meaningful name brings so many memories to my mind. A highschool road trip to Eugene Bible College (now named Newhope Christian College) in 1978, and a repeat in 1979 – the many greeting cards I created for classmates while earning lunch money, the buttons we made in support of our military men & women and to honor those lost on the day of 911. Now a self-published #author writing my third book in the series #KidsHaveUpsAndDownsToo, I intend to bring to the world’s attention that no matter what’s happening at home, in your neighborhood, or with your friends you have what it takes to make good choices. This being inspired by eleven years traveling across 35 states and 5 countries as a yoyo professional encouraging kids to become champions in school and in life as I shared #TheNEDShow with 1.6 million kids. I can not measure the gratitude I have for #AllForKidz and as I move on in a more traditional management role I continue to focus on the dream of reaching exponentially more kids as a full time children’s book author concentrating on the hashtag #BeTheBuddy. I was a fighter. Survival of the fastest runner if I was losing. Fists flying, lots of yelling, and hearts pounding! Life was always in panic mode then it all made sense. Of course I was older & wiser with a beautiful family of my own and the best job anyone could imagine traveling the globe with just a yoyo and a heart for kids. 4,000 kids a week, 160,000 kids annually, and 1.6M kids later it was clear. I had what it takes to make good choices but growing up I had no one constructive in my life. #BeTheBuddy is a theme #BookerWeed promotes daily. Encourage kids to read, journal, and chase their dreams. Click About Me and discover what cultivates the landscape of a child’s future. No matter what’s happening at home, in your neighborhood, or with your friends you have what it takes to make good choices!